Rwanda has set a goal of be the first country to fulfill World Vision’s commitment to reach everyone, everywhere we work, with clean water, sanitation and hygiene by 2022. No one knows that better than Ferediana. Mukampazimpaka Ferediana (62) is a single grandmother that lives in the Mata community in World Vision’s Nyaruguru Area Program. Her three grandchildren live with her - Arianne (3), Jeannine (6) and Jean (9). Besides her daily struggle to provide for her grandchildren, one of her main challenges was access to clean water. 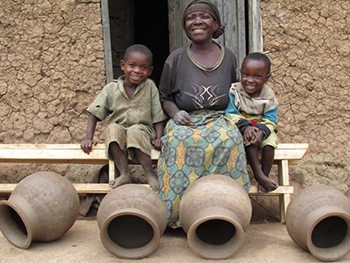 Ferediana supports her family by making pots out of clay, selling them for pennies. It takes her two days to finish one pot. She couldn’t afford even two meals a day or afford to buy the annual health insurance which is essential to have in Rwanda. “The only hope…when there is no meal at home, is to give water to children and make them sleep...but with the dirty water we had before, it used to cause more harm than good to our children,” she says. Ferediana and her grandchildren used to spend hours a day walking for water. The hand-dug spring often had a line of people. If her family got a late start, the line was even longer, making the children late for school almost every day. The spring down in the valley is the only source of water. Ferediana’s family and every community member would come every day to cue for hours and then hike to get the water home. Ferediana shared that even Saturday’s schedule revolved around the lack of water. “My grandchildren used to spend the whole day with me on Saturday, washing clothes at the spring. They had to wait for me at the spring while I was washing their clothes until the clothes dried, since they are too heavy to carry up the hill when they are wet,” she says. 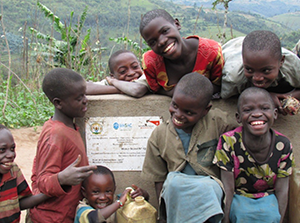 Through an excellent partnership with World Vision and Rwanda’s water and sanitation cooperative, Mata community received a well-constructed, gravity fed supply system that is currently serving several thousand people. The pipeline is over 12km in length and has 16 public water stands. One of them serves Ferediana’s home. “Now we have clean water nearby, we no longer need to go down the hill every day in the morning and evening to fetch water or spend the entire day on a weekend to do laundry at the spring,” says Ferediana. “May the God of heaven bless World Vision… Our lives are forever changed, and our children are very happy,” says Ferediana.